Details of reunions and social meetings from 2017 onwards will appear below. To view photos of past events, click on events archive. From 11.00hrs, meet & greet at our reception desk in the foyer. Rooms available from 15.00hrs. Don’t forget to visit the Association Shop, selling badges, ties, jumpers, etc available throughout the weekend. Evening meal will be taken in the Newton Suite. Rest of the evening socializing in general. 08.00 – 10.00 Breakfast in the restaurant. 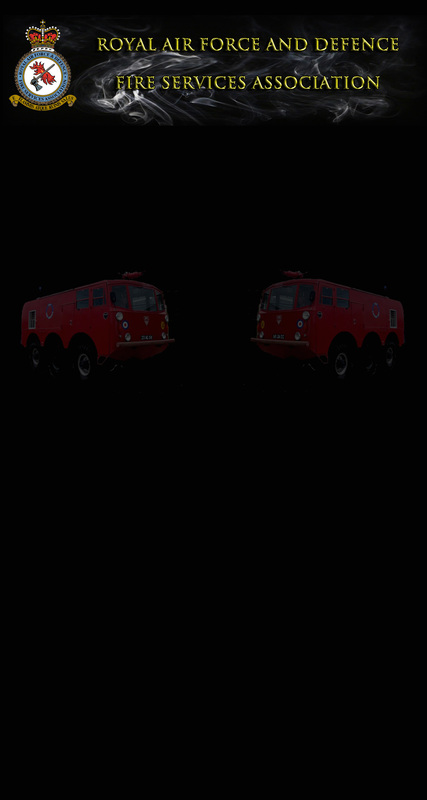 12.00 Coaches depart for the brand New Museum of RAF Fire Fighting in Gainsborough where there are waiting to welcome you. More details will be available on the updated programme on arrival. Coaches will also drop anyone off at the Gainsborough Shopping Centre if preferred. Coaches will leave at 1530 to return to the hotel. 18.30 Pre Dinner Wine Reception in the Newton Suite. 19.00 Gala Dinner is served in the Newton Suite. Rest of the evening enjoying the entertainment and association raffle. 19.00 Dinner is served in the Newton Suite. Rest of the evening socializing in general. 07.00 – 09.30: Breakfast in the restaurant and depart after a wonderful weekend. From 11.00hrs, meet & greet at our reception desk in the foyer. Rooms will be available from 15.00hrs. 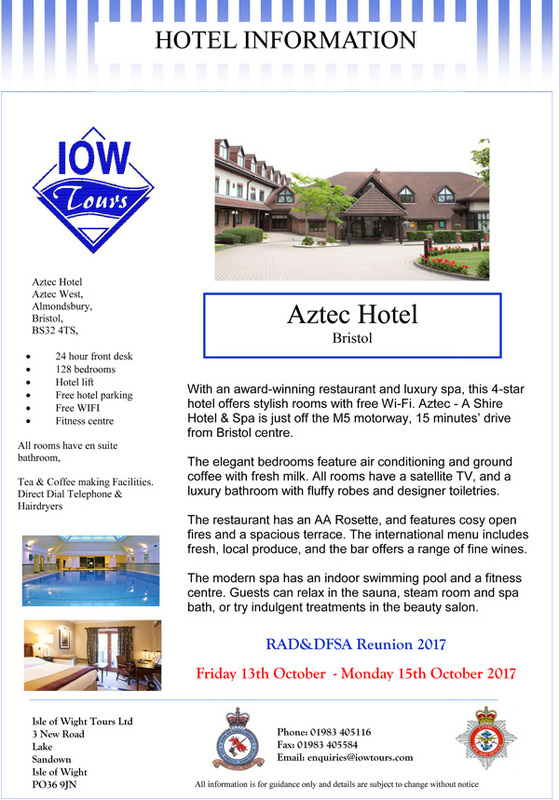 Arrive by car, taxi, train etc at the Aztec Hotel, check-in with IOW Tours and RAF&DFSA where the accommodation has already been prepared for your arrival. 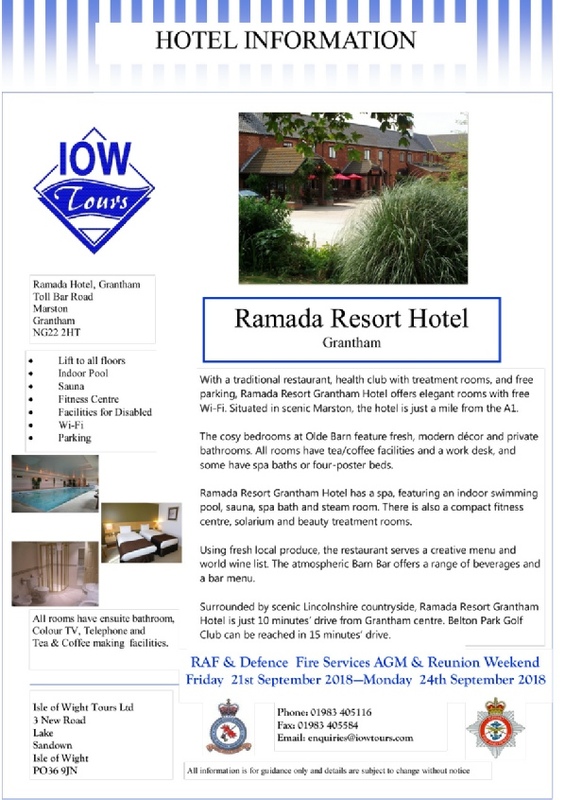 All accommodation has en suite bathrooms, colour TV and tea and coffee making facilities. Note: All this weekend, there is a 20% off bar prices on the bar. Evening meal will be taken in the Culbone Suite. 08.00 – 10.00: Breakfast in the restaurant. 12.30: Coaches depart, for the Helicopter Museum at Weston-super-Mare. See http://www.helicoptermuseum.co.uk/ for more details. 18.30: Pre Dinner Wine Reception in the Culbone Suite. 19.00: Gala Dinner is served in the Culbone Suite. 10.00: Coaches depart for our trip for a 3 ½ Hour River Cruise on the River Avon, taking in the wonderful sites of the river. Once up River you will be sailing under the Clifton Suspension Bridge. After the river cruise the coach will take you back to the hotel. 19.00: Dinner is served in the Culbone Suite. Rest of the evening socializing.